Buyers at 2-year-olds in training sales have at least one distinct advantage over yearling buyers: they get to see the horses perform. 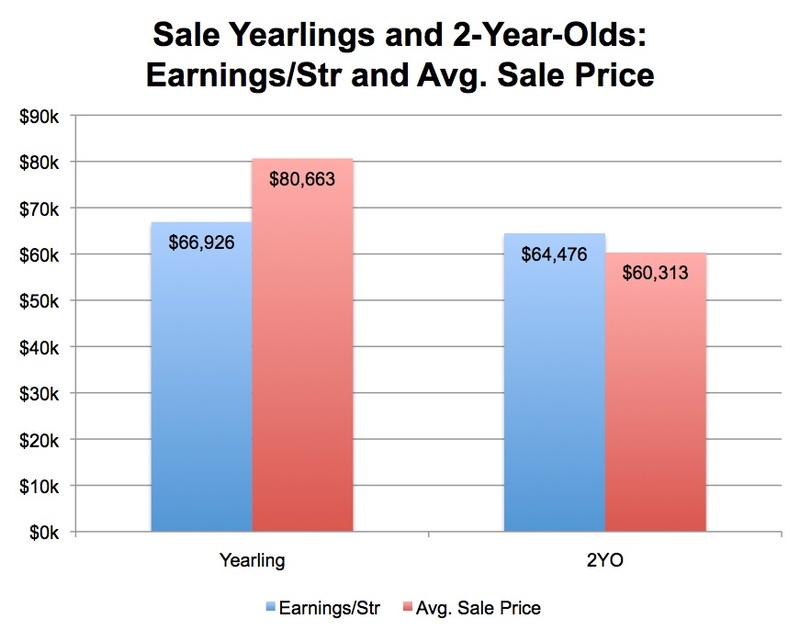 As a result, 2-year-olds are typically sold at prices that more realistically reflect their potential racetrack performance (measured by earnings). Meanwhile, yearling prices can be inflated due to the premium placed on pedigree (bloodstock value). 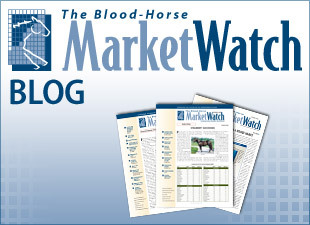 From the 2005-07 foal crops at the major North American sales, 17,069 horses were sold as yearlings and 5,360 as 2-year-olds. Excluding unraced horses, each group had comparable average earnings: $66,926/starter for yearlings vs. $64,476/starter for 2-year-olds, a gap of only 3.7%. But there was a greater disparity in average sales price—yearlings averaged $80,663, 29% more than the 2-year-old average of $60,313. 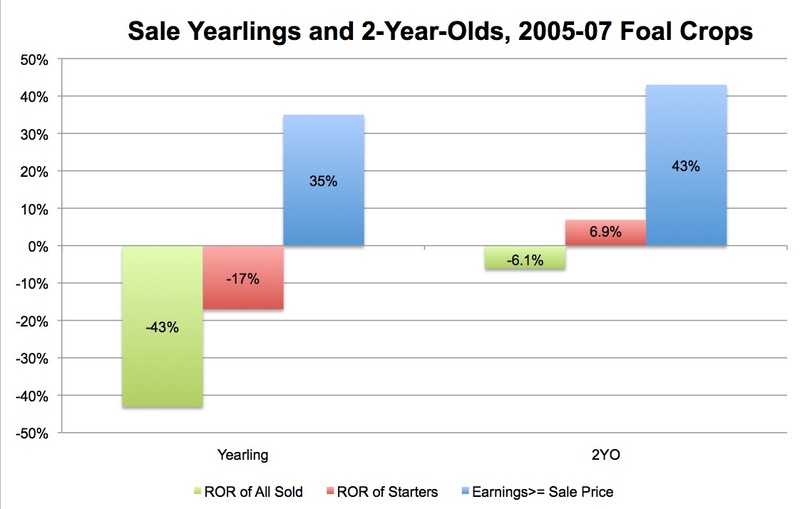 The rate of return (ROR) for each group suggests that 2-year-old buyers are more accurate in determining racetrack value. The ROR for sold yearlings from 2005-07 was -43%; the ROR for sold 2-year-olds was -6.1%, 37% better than the yearlings. The larger percentage of unraced horses from sold yearlings distorts the number slightly, but 2-year-olds still fared better when comparing the ROR of starters only: 6.9% for juveniles and -17% for yearlings. 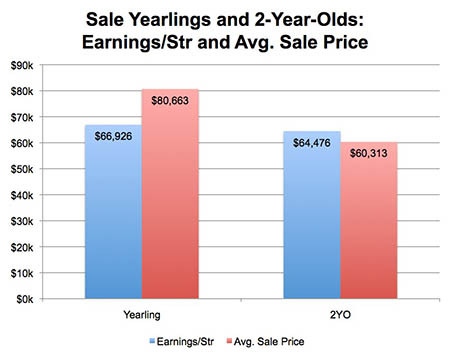 In total, 43% of the 2-year-olds sold eventually earned back their purchase price compared to just 35% of yearlings. Listed below are the top five graded stakes winners by ROR for yearling and 2-year-old sales from the 2005-07 foal crops.